Using a mandolin or a sharp knife, thinly slice the courgettes into discs. Grease an oven-proof frying pan (about 28cm diameter) then lay out a layer of courgettes followed by a layer of Parmesan. Grate some nutmeg over the courgettes then season with salt and pepper. Add a layer of basil leaves then some lemon zest (not too much) then add another layer of courgettes and Parmesan. Pour the beaten egg mix over the frying pan then season and bake in the oven for about half an hour at 170C. 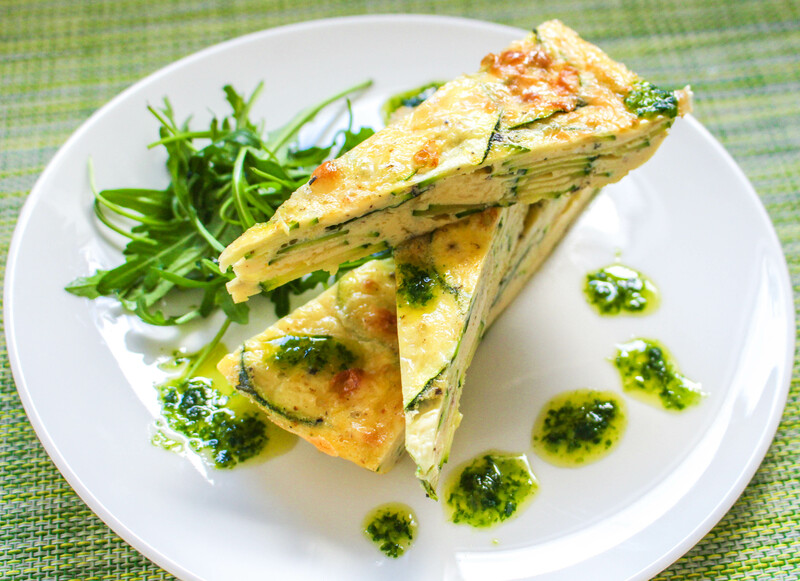 Allow the frittata to cool in the pan for about 5 minutes before transferring it to a wire rack to cool. If you leave it in the pan it will sweat and become soggy. To make the fresh mint sauce take a pestle and mortar and grind down the mint leaves with some lemon zest, salt and pepper. Add a dash of vinegar and some olive oil to loosen the sauce then drizzle over the frittata once cooked.